The 2009 Arnold Strongman Classic saw only the third new champion crowned since its inception in 2002. This year the honors went to Connecticut police officer and World's Strongest Man runner-up, Derek Poundstone, who improved on his second placing in the 2008 Arnold Strongman event. It was a see-saw contest with the six time Russian National Weightlifting champion, Mikhail Koklyaev, and Poundstone separated by a solitary point at the end of the final event. 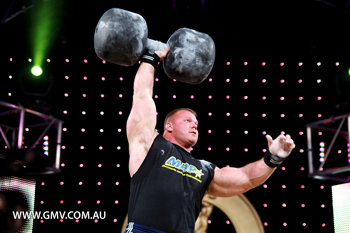 Poundstone's incredible world record of 15 successful circus dumbell lifts sealed the title over the mighty Russian. Strongman royalty were also present as judges, officials and MCs. These included Magnus Ver Magnusson, Bill Kazmaier, Žydrunas Savickas, Mark Henry, Odd Haugen and David Webster O.B.E. 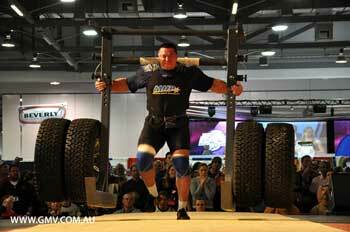 Please click here for the 2008 ARNOLD STRONGMAN CLASSIC, GMV-700DVD. Mikhail Koklyaev and the Heavy Yoke. Travis Ortmayer heaves a Manhood Stone. Derek Poundstone winning the Circus Dumbell and the Strongman title! Winner Derek Poundstone is interviewed by Governor Schwarzenegger.